Whenever I prepare Tsampa, I think of Choe-la, a Tibetan nun who lived with our family and helped look after us children. Choe-la’s smiling face, as she grew older, filled with wrinkles, but she had always so many stories to share of her life. Each story she would tell with great laughter, and a twinkle in her eyes, glowing brighter as the story rose to a climax. She told happy stories of her life as a child in Tibet, in her teens traveling with a merchant caravan dressed as a boy riding astride a horse like a man, then as a young woman in exile, stranded with her master’s two children whom she raised by doing laundry in Kalimpong. She also told me stories of the hardships and heartache … of life in the early 60’s at Bod-so-khang (now TCV) when they barely had enough to feed every child, when they didn’t know how many would survive the night. She told me how she and others would go scavenging in the nearby hills for edible leafs and herbs to put in the children’s soup when otherwise there was nothing. The Tsampa making process is quite a complicated and long production. My mother would get barley grown at high altitude from Manali or Ladakh. Once it arrived, Choe-la would get one or two helpers and they would start the washing process – which is tedious and time consuming. Then comes my favorite part, which is the roasting. The washed and dried barley is roasted in hot sand until the barley is cooked through – like popcorn, one can smell the roasted barley or “yoe” as we call it, from a distance and Choe-la would allow us kids to fill our pockets with fresh “yoe” to eat on the way to school. Next is the final step of grinding the roasted barley into Tsampa flour … Choe-la always said, the best Tsampa comes from the “chu-tha” – water mill. My mother would hire a jeep for Choe-la to take the bags of roasted barley to the “chu-tha” in lower Dharamsala. I remember accompanying Choe-la once or twice … and I still remember how she would be in her element once at the “chu-tha.” The local Indian mill owner and Choe-la were best pals even though they couldn’t understand a word of each other. They operated in a world of their own of smiles and gestures. Choe-la running up and down, checking the tsampa as it came out of the mill, gesturing, complaining, waving her hands frantically until finally the Tsampa is the exact consistency that she wants, and then she would then smile happily at her Indian friend. It would be late evening by the time we bag all the Tsampa and head home but with an extremely pleased and content Choe-la. Once home, my mother being the generous lady that she is, will make bags of Tsampa for every relative and high lama in the vicinity of Dharamsala. I will never forget watching and helping Choela bag the Tsampa – some bags would be filled completely full for people that she approved of, while others would be rather dismally filled after a little grumble and my mother would gently reprimand her saying, “give and you shall receive” – my mother is one of the most giving of all people that I know. Anyways, back to Tsampa …. living in the West, there is no Choe-la who will help make Tsampa for my family and we have to resort to making our own. 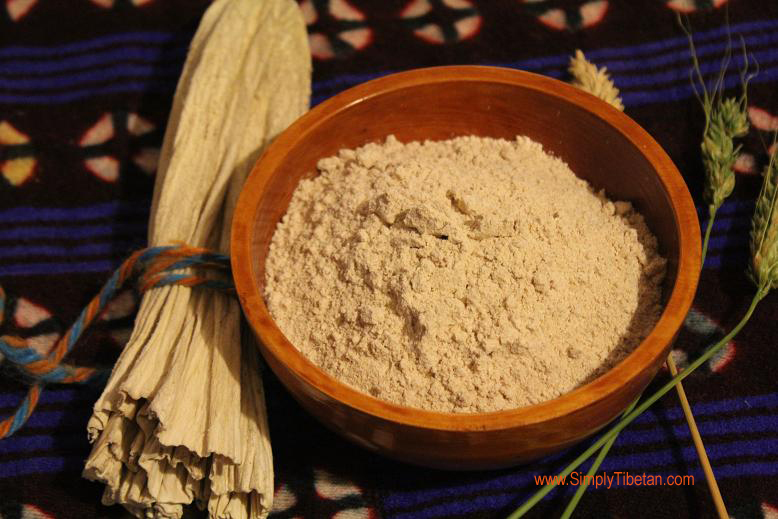 My dear friend Dolkar la, kindly shared her Tsampa recipe and technique with Simply Tibetan and I happily post it here for you. 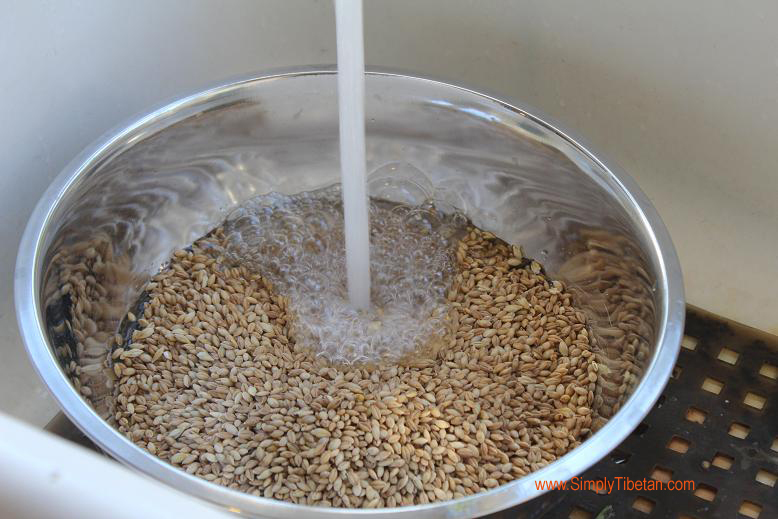 Put the barley in a large container and wash it under running tap water until completely clean – gently scrub to gent the loose hull off. 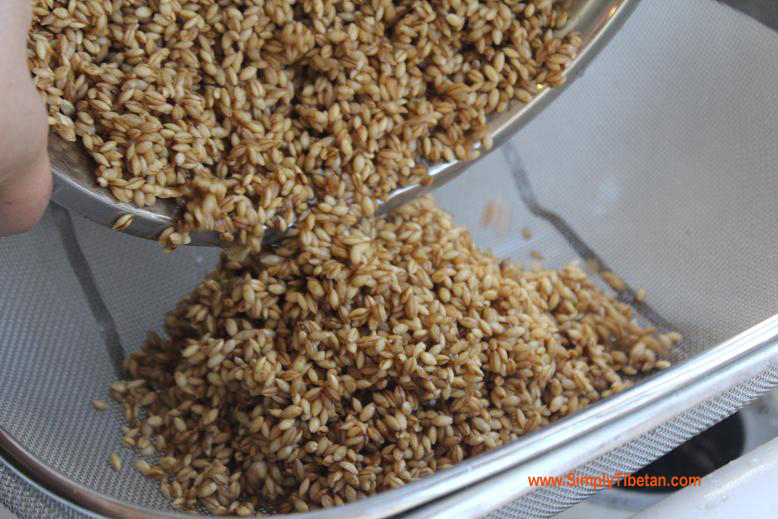 Gently pour the hot water over the strainer with the barley until all the barley is washed with the hot boiling water. Immediately, cover with a clean cloth and let stand for about 15 minutes. The steam will slightly cook the barley and make it better for roasting. 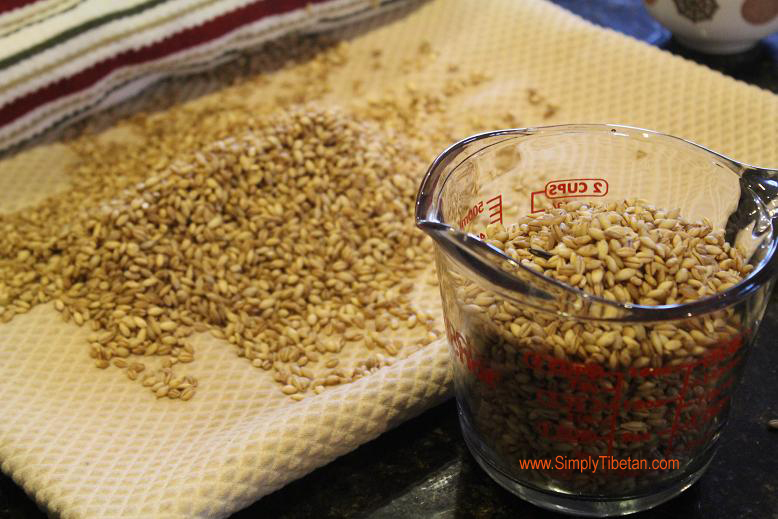 Spread the barley out on a clean cloth and let dry slightly – 15 minutes. Heat a large wok or big pan – once its very hot, addd a portion of the washed, dried, barley and keep stirring, until all of the barley is roasted. (Its like making pop corn). Final step is the grinding. My friend used a flour grinder – so it was very easy and a must have if you make large quantities of tsampa. (But if you eat tsampa only occasionally, then you can also store the roasted barley or “yoe” in an air tight container and grind small quantities with a coffee grinder – this way you’ll have fresh tsampa when ever you want to eat it). In USA, in the northwest, there is Bob’s Red Mill , they have an online presence, they sell pearl barley, and hulled barley, and hull less barley. Also worth your while would be a visit to the website of Purple Mountain Tsampa. To health! Sorry for the late reply. Please feel free to use. Hi do you mind if I use this recipe for a school project?? thing for you. And ask your sales rep if there is a warranty or repair plan available. This is fantastic! I also want to know how to make those tsampa balls you knead by hand. Can you do a post like that? Thank you for this post on Tsampa making and also Choela. I have fond memories of Choela when she used to come to Nepal to visit us and was always anxious to go back to Dharamsala as soon as she got to Nepal. By the way, my Pala and Anila are the two kids that Choela looked after in Kalimpong after the Chinese invaded Tibet. Memories of her restlessness will always remain with us. This is awesome; thanks so much for sharing the story and recipe. I have a friend who spent a couple years in India and Nepal learning Tibetan, and she really misses having good tsampa. I’ve been looking for an authentic recipe to make for her; this is perfect! Excellent read… Know Choela and interacted with her whenever I see her in McLeod. I used to accompany my Mom to the chutha on regular basis and it was fascinating to see Choela’s generation interacting with the locals. 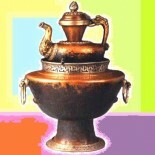 I wonder if Tsampa that we find in Dharamsala still go through the same arduous and meticulous process….??? Thank you very much for sharing this beautiful article about Tsampa and also about Choe la. 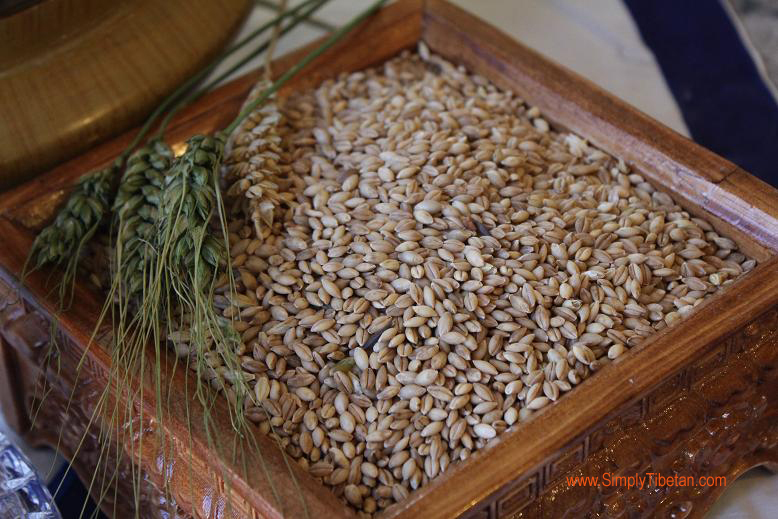 Hi Kalsang Dorji – I get my hulled barley from Wholefoods – their grain section carries it. But if you want in large quantities, you can also get it online wholesale. Where can u get the hulled barley in US? I mean which stores carry that? This entry was posted on March 19, 2014 by simplytibetan in Recipes and tagged tibet, tibetan food, Tsampa.